If you could increase your new patient inquiries by 25%, would you? A new study by Bright Local on the impact of online reviews on consumer choices reveals how you might be able to do just that. You just need to focus as much attention on your online reputation as you do your real-world reputation. Bright Local’s annual Local Consumer Review Study revealed some interesting statistics about how consumers use online reviews and ratings to make purchasing decisions. For instance, they found that 91% of consumers look at reviews when searching for a local business online. And, perhaps more importantly, 84% of consumers put as much trust in online reviews as they do personal recommendations from family and friends. This led Bright Local to their most recent study in which they tested the direct impact that star rating has on click-through-rates in Google’s search results. With over 6,000 participants, Bright Local conducted a thorough test of how ratings affect click-through-rates in Google Local Pack search results. 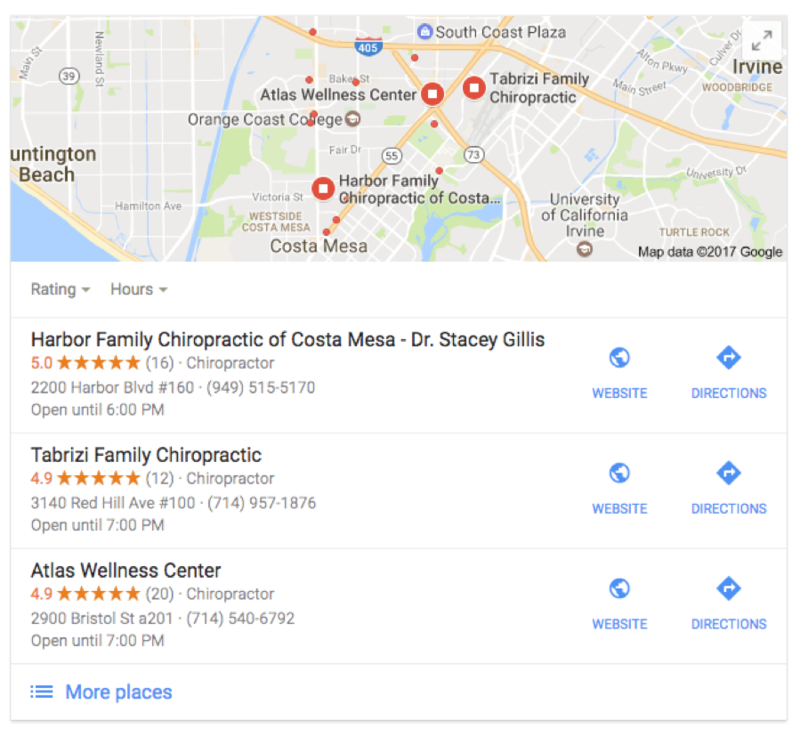 The Google Local Pack results are the three results that appear in local searches along with a map and general business info. They appear beneath the paid listings and the star rating is tied directly to a business’s Google My Business listing. 5 stars received 69% of the clicks. 4 stars received 59% of the clicks. 3 stars received 44% of the clicks. 1 or 2 stars received fewer clicks than listings with no star rating at all. This tells us that having a Google star rating of 3 or higher will result in more searchers clicking on your listing than having no rating. And significantly more than having only 1 or 2 stars. This also tells us that businesses with 5 stars will receive 25% more clicks than businesses with 3 stars. You want 25% more new patient inquiries? Try to get your 3-star rating up to a 5-star rating. Do you have only 1 or 2 stars? Then it’s critical that you work on getting more positive reviews because you’re receiving fewer clicks than your competitors with no rating at all. Once you have that in place, it’s time to encourage patients to leave positive reviews. Have a “Review us online” sign at your front desk with the Google logo on it so patients know where they can leave their review. When a patient is thanking you or raving about their experience, kindly request that they share their experience with others online. Send a New Patient Survey to get important feedback and encourage happy patients to leave reviews online. The Perfect Patients New Patient Survey is a great way to improve your online ratings while gaining valuable feedback from new patients. When you add a new patient as a subscriber to your website, a welcome email and survey is sent to them automatically. 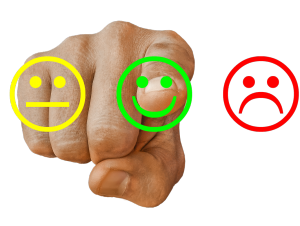 As they take the survey, our technology will determine the patient’s level of satisfaction and encourage those who are very pleased to leave a review on popular online review sites. This directly violates Google’s terms of service and they are very good at detecting fake reviews. This could result in the reviews being removed and/or your listing being penalized. Google is also very clear in stating that you should not offer any type of compensation (gift cards, cash, products, discounts, etc.) in exchange for reviews. While the reviews you could get from setting up a computer in your front office may be legitimate, Google sees too many reviews from one location as a red flag and is quick to remove them. If your practice could use a boost in new patient inquiries, take some time to work on your online reputation. 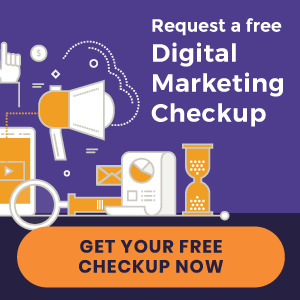 And then read “8 Ways to Improve Your Chiropractic Marketing Today” for more actionable tips for getting more new patients.